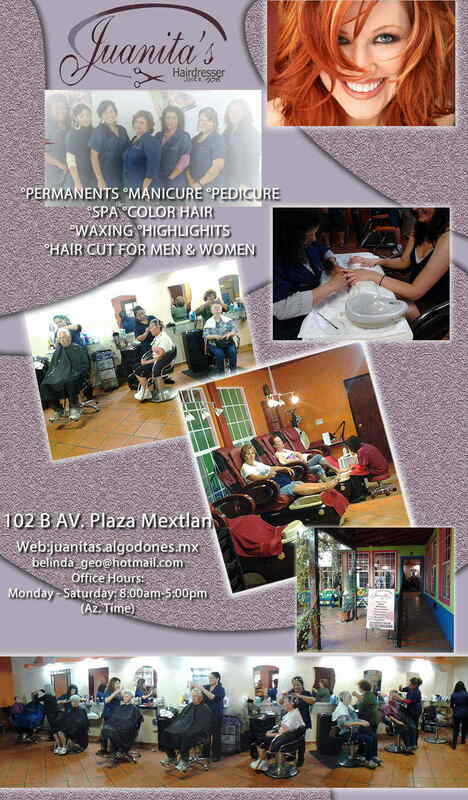 PERMANENTS, MANICURE, PEDICURE, SPA, COLOR HAIR, HIGHLIGHTS, HAIR CUT FOR MEN & WOMEN. Words:Juanitas in Algodones Visit Los Algodones Mexico in Algodones PERMANENTS, MANICURE, PEDICURE, SPA, COLOR HAIR, HIGHLIGHTS, HAIR CUT FOR MEN & WOMEN. Cuts Colors Facials Pedicures Manicures Highlights Permanents PERMANENTS, MANICURE, PEDICURE, SPA, COLOR HAIR, HIGHLIGHTS, HAIR CUT FOR MEN & WOMEN. Comment: I?d like to make an appointment for a perm on Wednesday August 1 2018. What is the price for the permset on short hair about 4 inches long? Comment: How much is a mans ordinary type hair cut? Im 73 and not looking for a styling. Comment: Can I make appt for Monday for for n cut about 11 am. What is cost? Comment: What is your phone number? Comment: Do you provide medical pedicures for elderly with diabetes? Comment: Will Elizabeth be working on Thursday or Friday this week? Comment: How much is pedicure and acrylic nail? Comment: The phone number is our land line in California. I would like to book a hair cut with Veronica for Tuesday at 10 a.m. Also my friend and I would like to book pedicures for around that same time if convenient. Please let me know. Comment: I would like to skedule an appointment for my mother on sunday please email me.